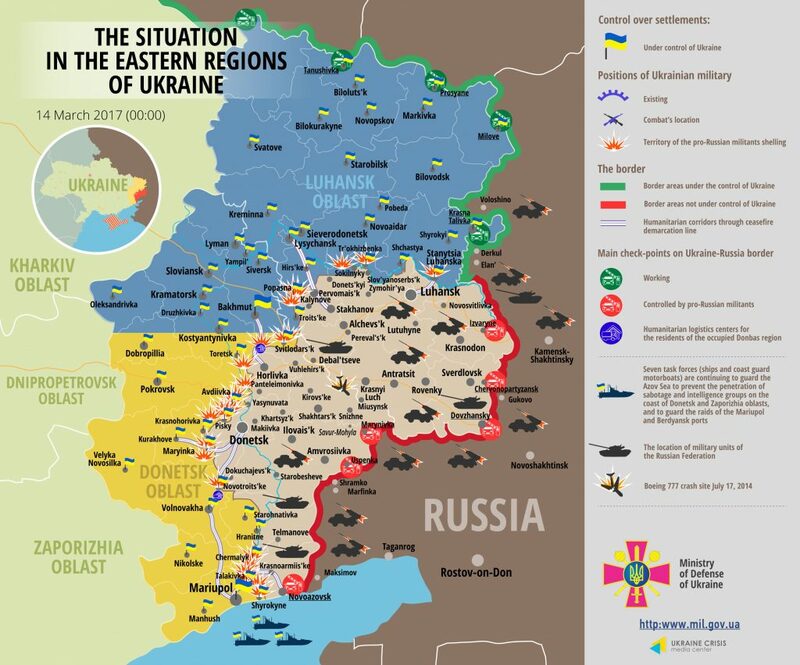 The situation in the Donetsk sector of the ATO area remains restless. “Militants are using heavy weapons along the entire frontline, namely mortar launchers, cannons and tanks,” informed the spokesman of the Ministry of Defense of Ukraine on ATO related issues Colonel Andriy Lysenko during a press briefing at Ukraine Crisis Media Center. Russia-backed militants became more active at the Svitlodarsk bulge in the afternoon. Following a series of mortar attacks at several positions of Ukrainian troops, militants employed cannon artillery. The fire continued six hours with recesses. A female civilian was wounded in Luhanske. “In the vicinity of Horlivka main hostilities took place in Zaitseve. Occupants used small arms during the day and heavy weapons during the hours of darkness. In total, about 10 attacks took place,” informed the spokesman. The situation is very tense in Avdiivka. Militants launched several dozen shells and tank projectiles yesterday. Russian proxies continue attacking non-stop. “As a result of aggressive occupants’ actions, the town has been cut off power supply and cellphone coverage is unstable,” emphasized Col. Lysenko. A series of militants’ mortar attacks took place in Pisky and Opytne. In total, 41 hostile attack took place in the Donetsk sector yesterday, and 20 of them involved the use of heavy weapons. Ukrainian Armed Forces incurred no losses in combat yesterday, but seven servicemen were wounded and sustained injuries. Hostilities in the Luhansk sector continue along the entire frontline. Krymske, Novooleksandrivka and Troitske were the main “flashpoints” yesterday, as militants used mortars there. Over 40 shells were fired at Ukrainian positions. “Moreover, militants conducted three sniping attacks (one in Novyi Aidar and two in Popasna area). Ukrainian troops are actively returning fire,” said Col. Lysenko. In total, 24 militants’ attacks took place in the Luhansk sector in the last 24 hours, and six of them involved the use of mortar launchers. The morning in the Mariupol sector in the Mariinka district started with Russian proxies’ attack from a tank toward the district center. They used mortar launchers in the afternoon. The occupants organized two intense attacks involving the use of mortar launchers and armor. “The situation is extremely restless in the south of the region, as before. Intense mortar attacks continued in Chermalyk – Shyrokyne frontline area from dawn till late night. Militants launched at least 130 mortar shells. Considering occupants’ aggressive actions, Ukrainian troops are systematically responding with fire,” added Col. Lysenko. In total, militants conducted 41 attacks in the Mariupol sector yesterday, using heavy weapons 14 times.